In March 2012, in an effort to make their distribution centers (DCs) as efficient as possible, Amazon acquired Kiva Systems for $775 million and almost immediately took them in house. There was confusion after the acquisition whether Kiva would continue providing DCs with Kiva robots. Although Kiva said that they would continue selling their technology to other retailers it soon became clear that Amazon was taking all Kiva’s production and that, at some future date, Kiva would stop supporting their existing client base and focus entirely on Amazon – which happened in April 2015 when Amazon renamed Kiva to Amazon Robotics and encouraged prospective users of Kiva technology to let Amazon Robotics and Amazon Services provide fulfillment within Amazon warehouses using Amazon robots. Consequently, there has been a scramble of new providers to fill the void left by Kiva’s technology, warehouse software systems and robots being removed from the marketplace. Many of these startups were showing their robotic systems at MODEX 2016 held at the Georgia World Congress Center in Atlanta. MODEX is a big material handling equipment, technology and systems show with 850 exhibitors, 250,000 sq ft (23,225 sq mt) of expo space, 100 informational seminars and over 25,000 attendees. Kiva’s robots and inventory management system were breakthrough technologies in 2011 and 2012 enabling items that were to be shipped to be brought to the packer near the truck door, instead of the more traditional method of the picker/packer going out into the warehouse, picking the goods, and returning to pack and ship them. At the time Kiva started operations, robotic picking was still a premature science. Consequently Kiva focused on managing the rest of the process: receiving, de-palletizing and storing items and bringing dynamically-stored shelves containing ordered items to the picker/packer to pick, pack and ship while the Kiva robot returned the shelves to the most appropriate area in a free-form dynamic warehouse and autonomously went off to bring the next shelf to another picker/packer. Although vision systems and grasping technologies have improved since then, they still aren’t fast and flexible enough to replace humans so, instead, most new systems attempt to augment humans by reducing what they have to carry and the distances they have to travel to get the items that were ordered. Iam Robotics, a Pittsburgh startup founded by a couple of CMU grads, is the only vendor that uses a robot arm to grip goods. It 3D scans and identifies items to be picked into a cloud library and then uses a mobile picking robot to go to and pick items, place them in a tote, and then place the completed tote on the nearest conveyor to a packing station. Locus Robotics, a Massachusetts-based company founded specifically in answer to the Kiva situation by a Kiva-using DC owner, uses a fleet of robots integrated into current warehouse management systems to provide robotic platforms to carry picked items to a conveyor or to the packing station thereby reducing human walking distances and improving overall picking efficiencies. 6 River Systems, a Massachusetts startup comprised of ex-Kiva execs, had a booth but wasn’t even showing a photo of their solution. VCs have seen the 6 River System, however, and value it highly: 6 River just got $6 million in financing from a group of VCs including iRobot. Fetch Robotics, a Silicon Valley startup that uses two different robots: one to pick and the other to assist workers as they pick by carrying the items and taking completed orders to the shipping station – autonomously. Magazino, a German startup that was not at MODEX, has a mobile picking system that has a retractable and rotatable column with a gripper system and a removable shelf. It is able to grasp rectangular objects from small softcovers to shoeboxes up to heavy cases. 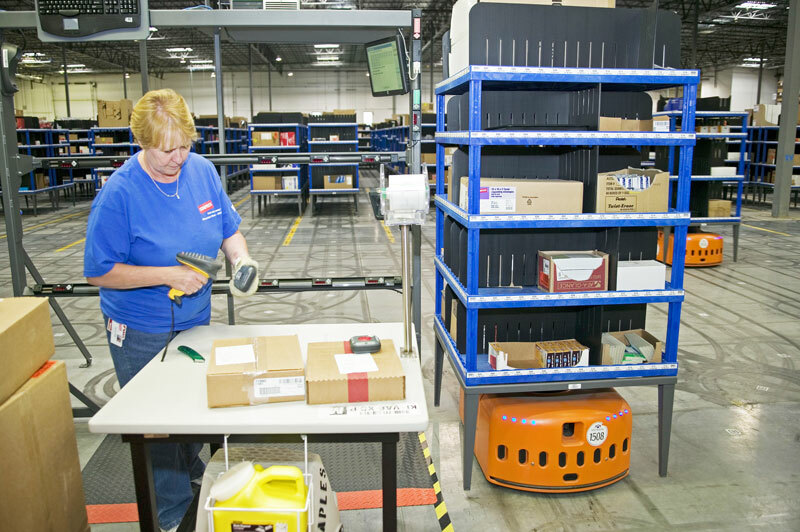 The robot stores items in its built-in shelf and delivers it to a shipping station. Grey Orange, an Indian startup that was also not at MODEX, has a system and product line strikingly similar to Kiva’s original offerings except that their robot is square and Kiva’s is round. GreyOrange has over 300 employees and its robots provide service to India’s e-commerce giants Flipkart, Jabong and Mahindra and has been signing distribution partners in Japan and throughout Asia and the Pacific. InVia Robotics, also not at MODEX, a Southern California startup with two robots very similar to Fetch Robotics’ except InVia’s method of picking is similar to Magazino’s. It grabs items and slides them onto a platform which then slides the item into a bin and, when the order is complete, slides it onto an autonomous mobile delivery robot. Mobile platform systems are designed to work across multiple environments – DCs, warehouses, factories – and are autonomous mobile platforms that can be fitted with special-purpose payloads such as for receiving, restocking, inventory, moving material from work cell to work cell, picking, supporting human pickers, packing and palletizing. Many vendors have provided AGVs, carts, lifts and tows, and have done so for many years. The older versions of these systems use markings, tapes, beacons, sensors and other things on the floors and ceilings to provide location information. Newer systems use the latest 3D vision systems, collision avoidance and mapping software to easily enable autonomous point-to-point navigation. Clearpath Robotics is offering 2 transporters: one for heavy loads of up to 3,300lbs and the other for light loads of up to 220lbs. Both can be fitted with a carrying cart, bin carrier or a plain flat plate, and both have an intuitive lighting system similar to white headlights in the front, red in the rear. Clearpath is an established provider of robotic utility vehicles for the military and academia and are taking that experience to provide solid mobility platforms for customers to do their own thing. MiR Mobile Industrial Robots, a Danish startup headed by Thomas Visti (who was VP at Universal Robots of collaborative robots fame), has begun to sell a small transport for logistics and healthcare. It operates as both a tug and/or a platform. It has 2 scanners and a 3D camera to make sure that it sees people and obstacles. Seegrid calls today’s vision guided vehicles the next generation of AGVs. Many vendors have, for years, provided material handling AGVs used to tow carts and pallets around warehouses, hospitals and factories. They depend upon beacons or floor and wall markings for their navigation and are efficient but klutzy. Armed with lower-cost LiDARs and Kinnect-like infrared 3D camera systems, new players like Aethon and Seegrid entered the market with new capabilities – including being able to autonomously unload containers: vision guided robotic lifts, tugs and platforms. Aethon is a Pittsburgh-based provider of autonomous tugs used in hospitals and factories. Some of their AGVs (they have more than 400 in the field) have been outfitted for secure medication delivery, and all of their robots are assisted with their Cloud Command Center, a 24/7/365 remote monitoring service to get the tug out of whatever unplanned situation in which it finds itself. Seegrid, also based in Pittsburgh, has focused their vision guided kits and lifts on the distribution center marketplace (their main investor/partner is Giant Eagle, a large East Coast grocery chain supported by multiple distribution centers). Seegrid has also partnered with forklift manufacturer Raymond to integrate their vision guided system onto Raymond lifts. Most recently Seegrid unveiled a monitoring system likened to a subway platform display showing when the next train is coming, to provide awareness to approaching devices and also to provide human assistance when needed. Balyo, a French manufacturer of handling robots has recently partnered with Linde and Hyster Yale to integrate and provide their vision guided systems onto forklifts and tows manufacturered by Linde and Yale. As an aside, Seegrid recently held a contest to acknowledge journalists covering the materials handling industry and they awarded The Robot Report third place at an Awards Celebration event held after hours at MODEX in Atlanta. First place went to John Hitch, a staff writer at New Equipment Digest; second place went to Bob Trebilcock, Exec Editor at Modern Materials Handling. Thanks very much.